LED facials are painless, non invasive, and relaxing skin care treatments. LEDs (Light Emitting Diodes) send low level light energy into the deeper layers of the skin. 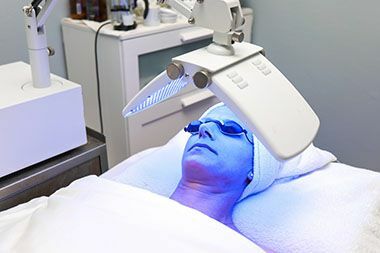 Our advanced Bio-Synthesis LED light therapy system uses high intensity red, yellow, green, and blue LEDs to rejuvenate and replenish your skin. Reduce fine lines, wrinkles, rosacea, and acne, and promote healing - for both men and women. LED light therapy plumps up aging skin by boosting collagen production. It treats mild to moderate acne by sending low-level light energy into the deeper layers of the skin to kill bacteria and reduce inflammation. LED light also encourages natural moisturization and healthier, more youthful-looking skin. In 1500 BC, the Greeks first recorded the healing properties of light. Exposure to light was essential the restoration of health. In 1805, Dr. Neilson Finsen received a Nobel Prize in medicine for showing the beneficial effects of various wavelengths of light in the treatment of Tuberculosis. Today, NASA uses LED technology to promote wound healing and tissue growth. AGE DEFYING: By stimulating collagen production and helping to heal damaged cells, LED light therapy plumps up skin, reduces wrinkles, and brightens aging skin. ACNE CONTROL: In addition to its anti-inflammatory properties, LED light kills bacteria (propionibacterium acnes) that lives below the surface of the skin in the oil glands. PSORIASIS & ECZEMA: Blue and red light therapy helps reduce the body's Inflammatory responses. Exposure to red light also helps suppress overactive skin cells. ROSACEA: Red light therapy for rosacea reduces inflammation, tightness, itching, flashing, and occurrence of pustules. It restores the skin's natural moisture, evens skin tone, and also alleviates sunburns. ACCELERATES HEALING: ...especially after chemical peels and invasive plastic surgery. 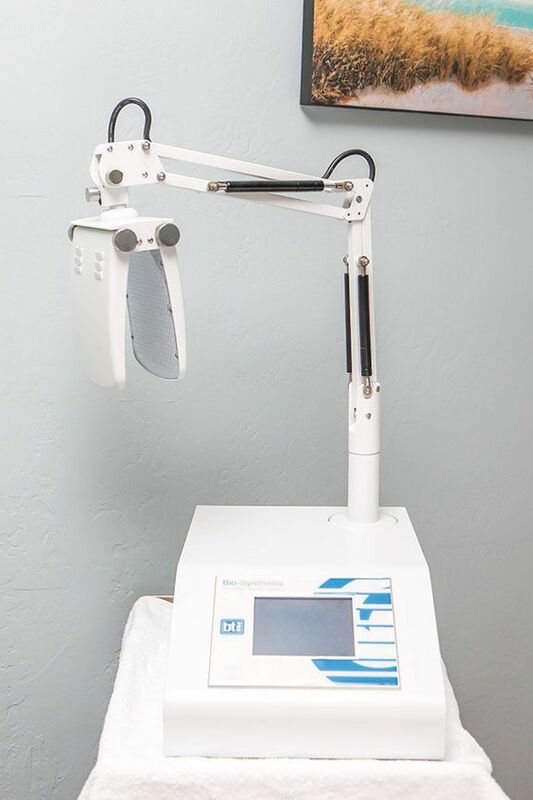 PHOTO DAMAGE: LED therapy helps the treatment of sunburns, the appearance of age spots and age-related pigmentation. HYDRATION: The healing properties of LED light wavelengths encourage natural moisturization and healthier, more youthful-looking skin.